Ever wonder why some objects in Sibelius are colored dark blue when you select them, and others are colored light blue — and other objects may be colored green, orange, pink, purple or even red? These colors won’t print, of course; they’re merely intended to help you differentiate among certain items. Knowing the color code could help you as you work with your music. Each note can be assigned to one and only one voice, so notes will appear in one of the first four colors when selected. This is also the case with magnetic (note-attached) slurs and the articulations and accidentals that one would ordinarily apply with the Keypad. Certain staff-attached objects, such as Expression and Technique text, chord symbols, lyrics, glissando and octave lines, and many symbols like breath marks and mordents can be assigned to a single voice, so you may see them appear in one of the first four colors. However, these items can also be assigned to more than one voice at once. If that’s the case, then these items will appear light blue when selected. Other staff-attached objects, like clef changes and instrument changes, always appear light blue when selected, because these items always apply to all voices. Keep in mind that when it comes to passage selections, a similar logic applies: staff selections are in light blue; system selections are in purple. If you’ve entered a note or staff-attached object in one voice, but you’d like to change it to another voice, just select the object and then click the voice number in the Keypad, or go to Note Input > Voices > Voice. To do this even faster, use the shortcuts Alt+1/2/3/4 on PC or Option-1/2/3/4 on Mac. To make text, lines, or symbols apply to all voices, simply select the item(s) and type Alt+5 (PC) or Option-5 (Mac), or click the All button on the Keypad. 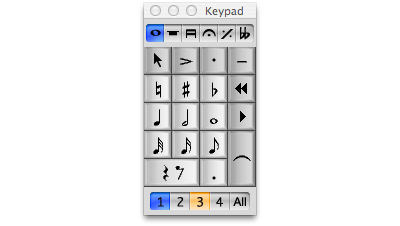 Note that if you need an object to appear in combination of voices (e.g., voices 1 and 3 only, but not 2 and 4), you must click the buttons on the Keypad with the mouse rather than use the shortcuts. Assigning objects to certain voices may not seem like a big deal. However, during playback, depending on the instrument, Sibelius will interpret the dynamics on a per-voice basis – but only if they’re assigned correctly. Further, filtering voices by using Home > Filters will return different results depending on how items are assigned. If you have Magnetic Layout switched on, which it is by default (under Layout > Magnetic Layout), and View > Magnetic Layout > Collisions checked, Sibelius will color objects causing collisions (or nearly so) red, whether or not those items are selected. You should attempt to resolve those collisions by moving things around or by optimizing staff spacing. Certain slurs may also be colored red when selected. These are uncommon but occasionally useful non-magnetic slurs that can be placed when nothing is selected in your score. Notes that are too high or low for a particular instrument’s range will be colored bright red if they are outside of what Sibelius defines as the instrument’s “professional” range; notes that are within this range but deemed “uncomfortable” are colored dark red. These ranges can be modified by editing the instrument in Home > Instruments > Edit Instruments. If you type in a chord symbol that Sibelius doesn’t recognize, it will be colored red. Remember, all of this colorful goodness won’t print; it’s only there to help you decode the many different objects in your score. Should you actually wish to let out your inner Scriabin, you can apply colors to items in your score by going to Home > Color. Also, Bob Zawalich has written many useful plug-ins that work with color, all of which may be downloaded directly through Sibelius 7 or 7.5 at File > Plug-ins > Install Plug-ins > Color. Users may also install these manually in Sibelius 6, 7 or 7.5 by visiting the plug-in download page and following the usual manual installation procedure, or by using the Install New Plug-in plug-in. Updated 5:00 pm with additional information about red-colored objects. Very useful, Philip, and fun, too! (Admittedly, I am easily amused). I might add that out-of-range notes are also colored, light red if out of the comfortable range, and red for out of the professional range. And the playback line is always green. User have no control over the colors used in this way, despite years of users requests. Admittedly, there is a lot of interaction with the colors that have meaning, and it would probably be tricky to implement a user color scheme. There is an entire category of Color plugins on the plugin download page. Some, like Apply Named Color let you apply colors more precisely that using the color wheel. Others can change, trace, replace, or copy colors. My biggest peeve with Sibelius colors is that if you color a note in a multi-note chord, all the notes in the chord get the same color. Prior to Sib 6 you could use the Pitch Spectrum feature to get around that, but it is no longer available. Bob: Many thanks, as always, for your helpful supplemental information! I’ve updated the post with information about your color plug-ins. The shipping plugins Color Pitches and Boomwhacker Note Colors, both in the Notes and Rests category are also useful coloring tools. Notes and Rests plugins are found in the Note Input tab on the Sib 7+ Ribbon, you can use Find In Ribbon to find them. IMHO the light red and the red are a bit difficult to distinguish in instrument range. Is there any way to change it ? Tiago: Thanks! I updated the post with more information about red-colored objects. As far as I know, there is no way to change the color of the notes out-of-range instruments, or indeed any of the display colors in Sibelius. Thank YOU Philip for such great blog. I sometimes get caught off-guard when the page turns cream-coloured and the writing turns orange. Why does that happen? Talitha: That means you’re viewing a part, instead of the score. 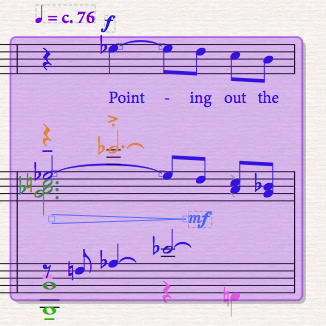 The orange writing means that there is a difference in positioning between the part and the score. See the Parts section of the Reference guide for further details. I figuredout what it means but I don’t know what I did to make it happen and how I get out of that view. I will consult the Parts section, as you suggest, and see if there is enlightenment there. Talitha: The easiest way to switch between the score and a part in the shortcut key W. You can also click on the “plus” menu on the upper right-hand part of the screen, which will reveal a list of the score and parts in your document, from which you can choose. Ahh . . . I must have been hitting the W accidentally. How can you remedy this? It does print in red if left alone. Tricia: You can put this chord symbol in as a legacy chord symbol. Choose Chord symbol from the Chord symbols (special) category of the Text > Styles > Style gallery to type a single legacy chord symbol into the score. Is there a way to change staff color (or opacity) and leave note color black? Thank you! Tim: Staff lines cannot be colored in Sibelius.